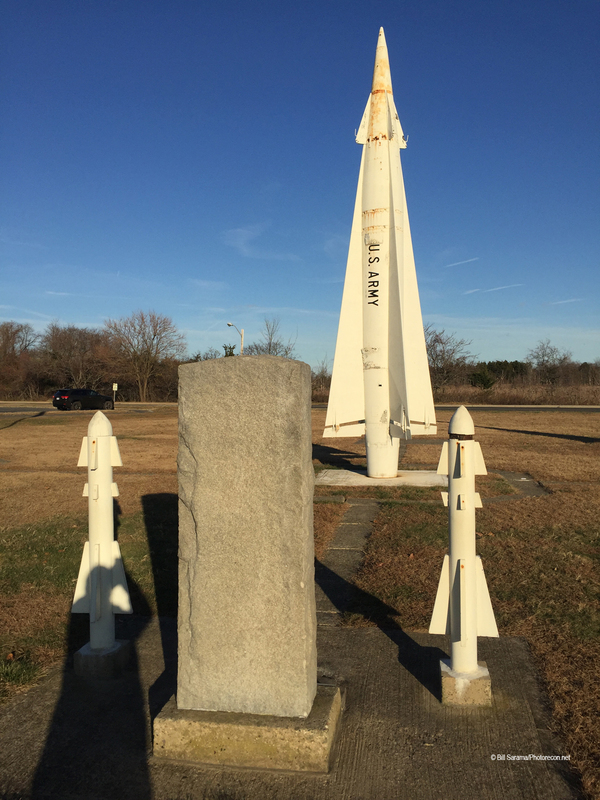 The early Nike-Ajax missiles came to Sandy Hook in 1954. 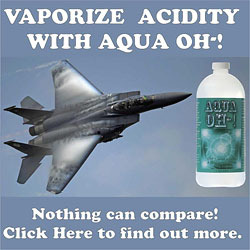 They were a 2-stage missile that used a highly flammable and explosive fuel mixture of: JP-4 jet fuel; an HNO3 Oxidizer of unsymmetrical Dimetral Hydrozine and Red Fuming Nitric Acid. As an ex-crew member once said, “This was really dangerous stuff!”. (On May 22, 1958, at the nearby Leonardo NJ Nike-Ajax Battery, Site NY-53, during a refueling operation, eight fully armed and fueled Nike-Ajax missiles blew up in a furious mushroom of fire and death. The explosion killed 10 persons, injured 3 and scattered explosive warheads across a wide area of the countryside. Service members in the underground Magazine Pit were not injured. Per news reports of the day, the eight missiles as they exploded actually launched short distances and ended up in neighborhood yards.) 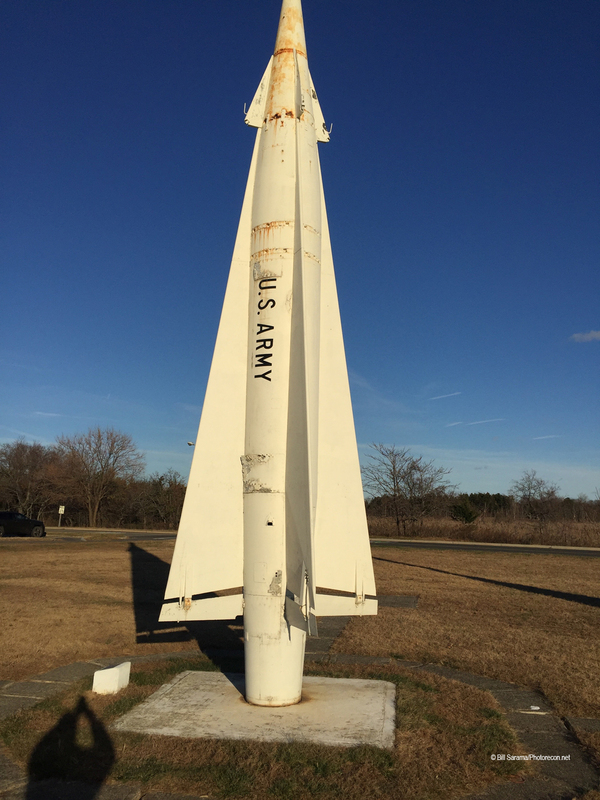 The Newer Nike-Hercules missile, at Sandy Hook after 1958, used a solid fuel propellant that was much safer and in the missile at all times (like the current Minuteman-3 ICBM missiles), Right near the Launch Pads were the Fueling Stations and the Nuclear Warhead Bunkers and other servicing areas. Separate above ground structures within the Exclusion Zone included: The warhead assembly and mating building and the liquid acid fueling building both behind a large earthen berm in case of explosion, especially with the Ajax missile, the missile assembly and testing building and the electrical power generator building. There would also be a separate nuclear and conventional warhead storage bunker and an acid fuel storage bunker. 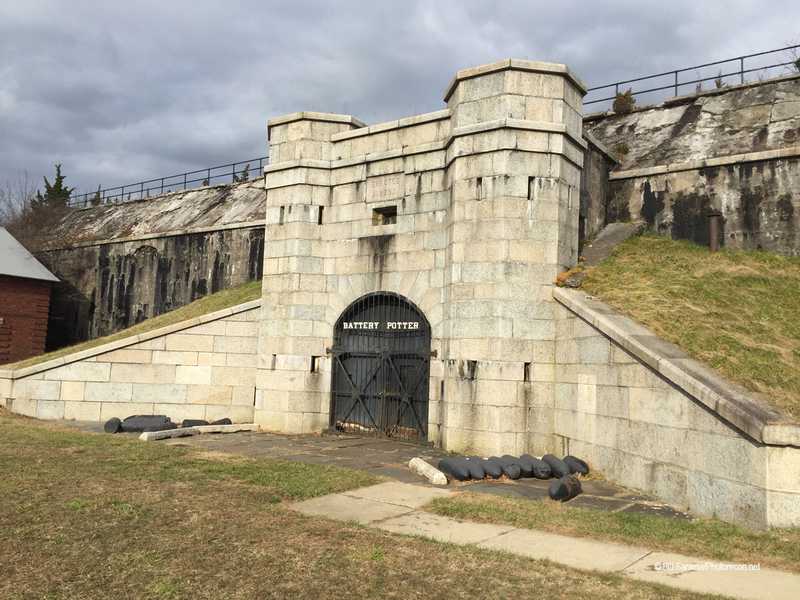 There would also be a nearby Ready Room and Crew Quarters for the men stationed at the Magazine Launch Area. Most of these were all removed from the Launch Area upon decommissioning in 1974. No remnants remain. 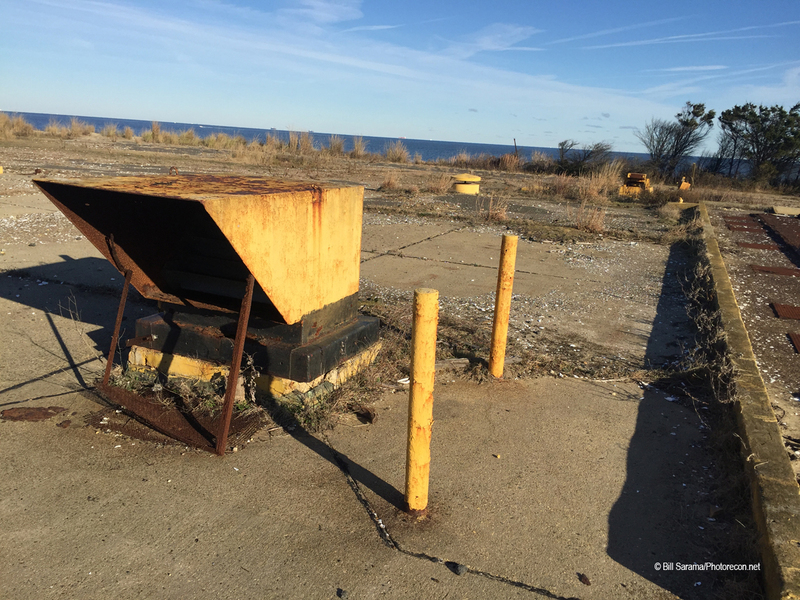 The coastline is quickly eroding the beach line at NY-56 and the Underground Missile Magazine Bunker is beginning to be exposed at the beach edge. 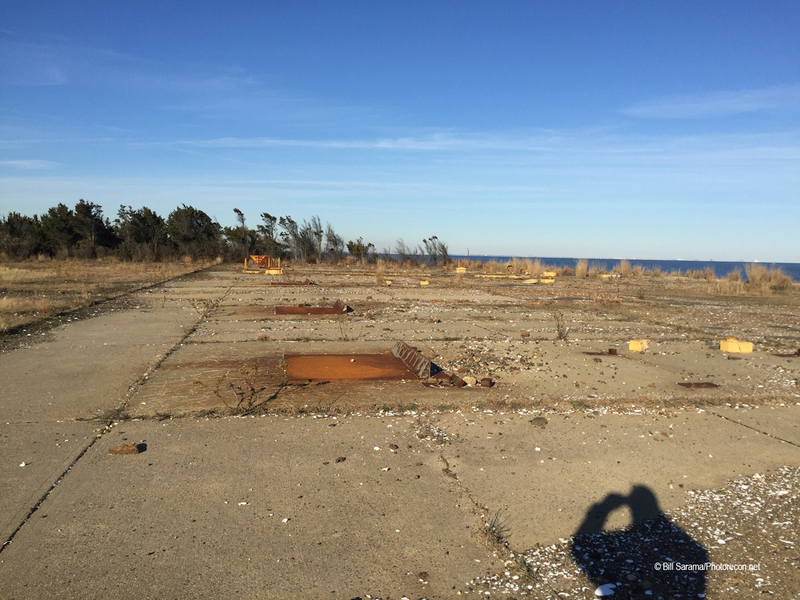 Soon the “Underground Bunker” will be an “Above Ground” building at the edge of the beach at Sandy Hook!!! 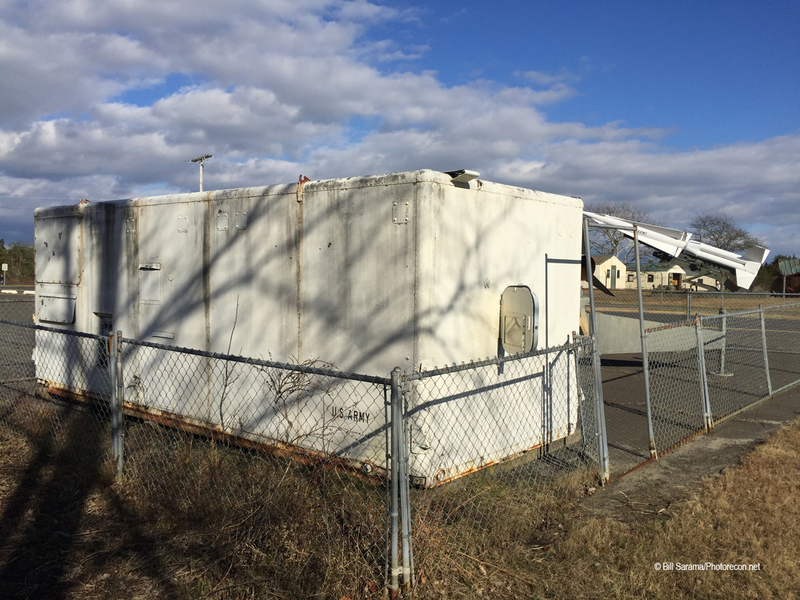 The Missile Control Radars and Computer Launch Trailers at the Sandy Hook NY-56 Battery were located about one mile to the north of the Missile Magazine Launch Area. 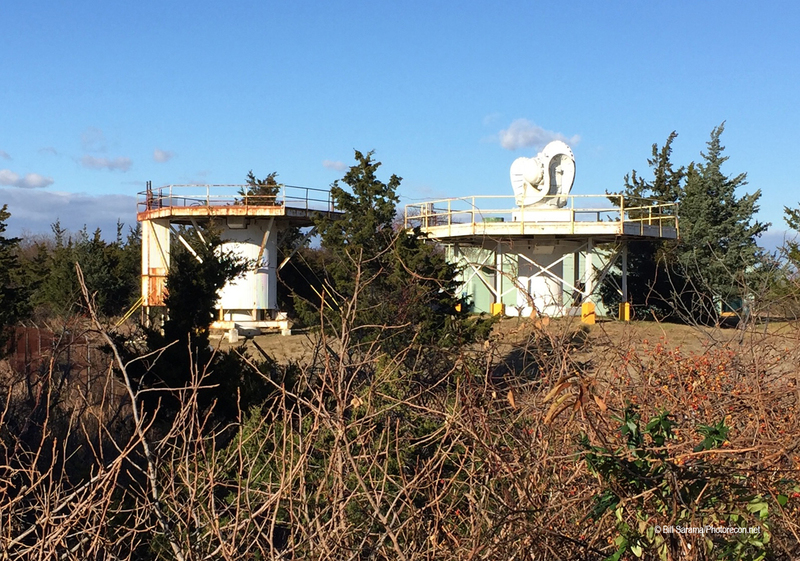 There are five Radar Stands, two with actual radar hardware, that still exist for public viewing at Sandy Hook. 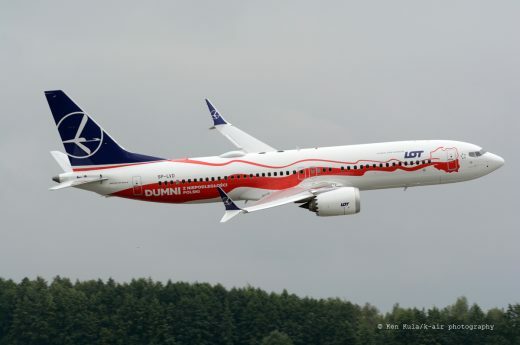 All five were recently refurbished and painted white. They are fenced in but very visible from the fence line. The National Park Service conducts guided tours into the radar stands and into a refurbished Launch Control Center from April to October. The Launch Control Center has computer terminals, computer mainframes, radar screens and communications systems that were actually used in the 50s and 60s here at NY-56. From the fence line you can see five Nike radars on top of their 15-foot high stands. The radome was removed from the large circular stand. The smaller octagon shaped stands have the actual radar hardware from the 50s on the stands. From satellite photos you can see that there are five additional radar stands that are in a second nearby radar cluster in a inaccessible fenced in area deep in the nearby woods. 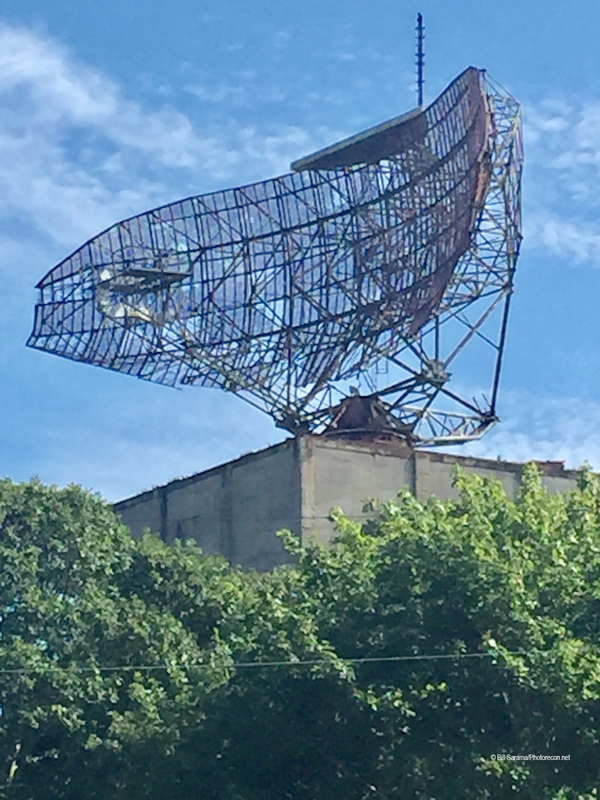 With a half mile walk, you can get fairly close to these radar stands as well off of Atlantic Avenue. 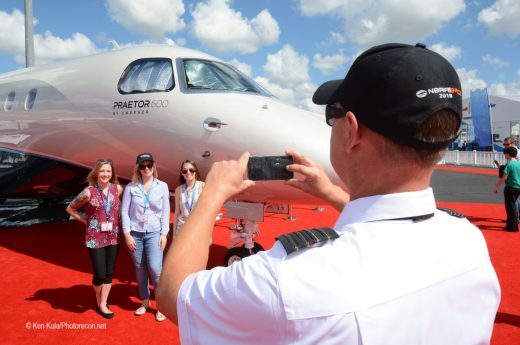 But don’t get too close; this second group of radars is Off-Limits! In this second group there appears to be two additional Nike missiles on horizontal trailers awaiting restoration and display. There would typically be five radars to control each cluster of 8 Nike missiles for outbound missile tracking and inbound target acquisition tracking. Therefore Sandy Hook NY-56 had 10 radar stands for its 16 Alert missiles. 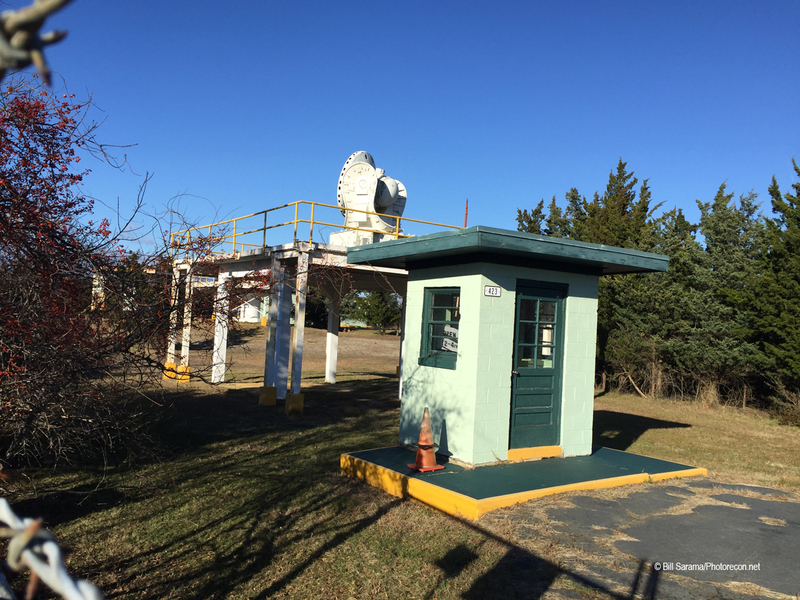 The radar cluster was at the “Integrated Fire Control Center” (ICF) about a mile north of the “Missile Launch Area” (ML) at Sandy Hook NY-56. The IFC also had an Administrative Area (A). 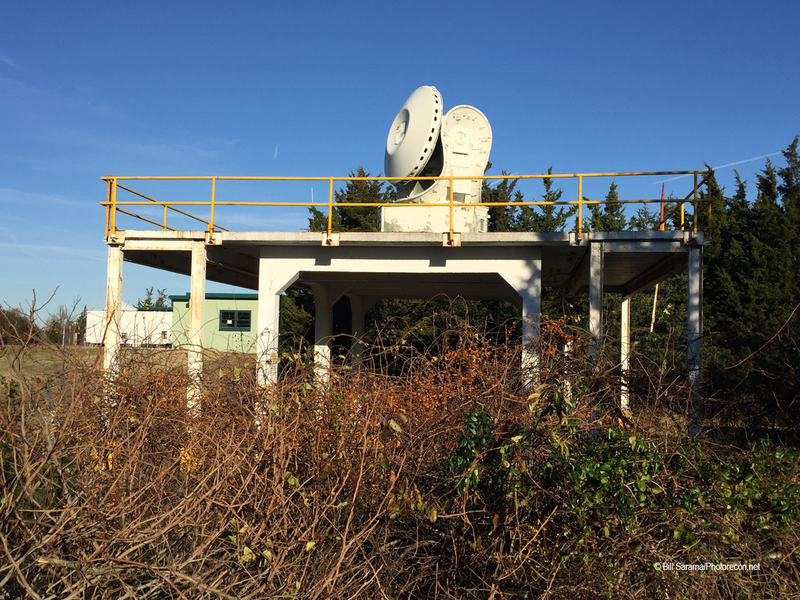 The IFC or Control Site at Sandy Hook contained the radars, and radar equipment for acquiring and tracking the target and the missile, the Battery Control Assembly, the Computer Assembly, an Early Warning Plotting Board, an Event Recorder, and a Switchboard Cabinet. Nike employed a Command Guidance System, in which the major control equipment was ground-based and not part of the expendable missile. 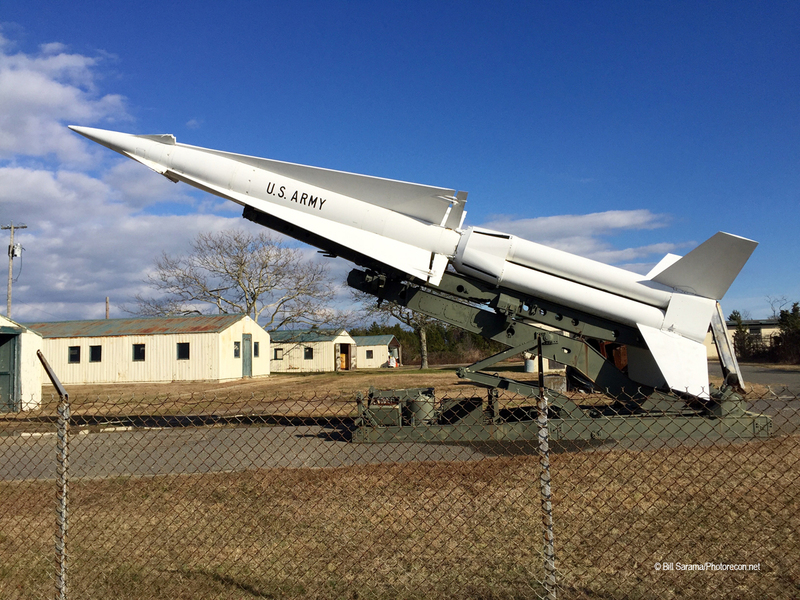 Each Nike Battery had full operational control of the Nike Ajax / Nike Hercules missile once it was launched. The site’s Acquisition Radar (ACQR) acquired the incoming target (Tu-95 bomber) at long range and provided pointing data to the Target Tracking Radar (TTR) which locked on to the target. The site’s Missile Tracking Radar (MTR) locked on to the missile prior to firing and tracked the outbound Nike missile. 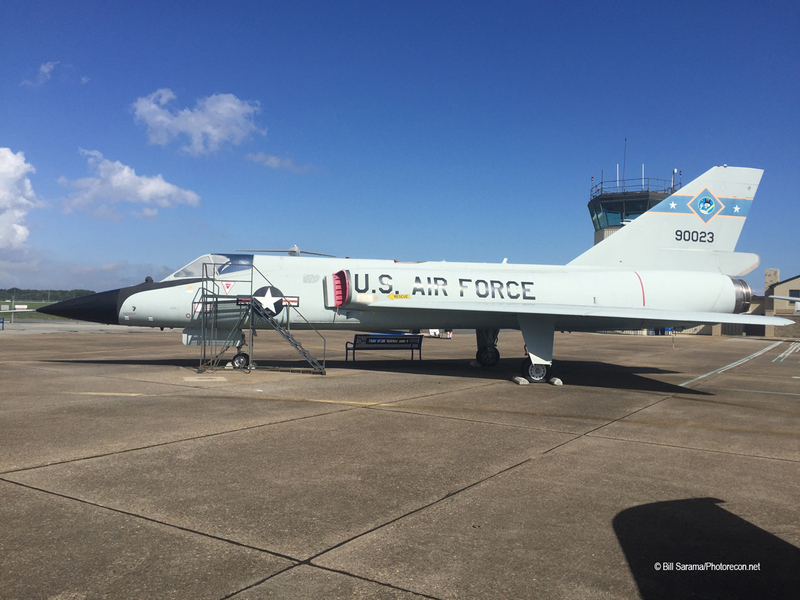 Data from the radars was fed into the data processing equipment which compared the position of the target and that of the missile and fed guidance commands into the missile to enable the intercept. The IFC also had its own electrical generating system. The original plan was for Nike to be a “Mobile System”. The operational control equipment for both the Launch Area and the Integrated Fire Control Consoles was housed in special large mobile truck trailers that could in theory be moved around as we’ll as the missiles. That never happened. What happened was that at Nike sites these trailers ended up being “Docked” at special “Connector Buildings” located at each IFC Control Site. 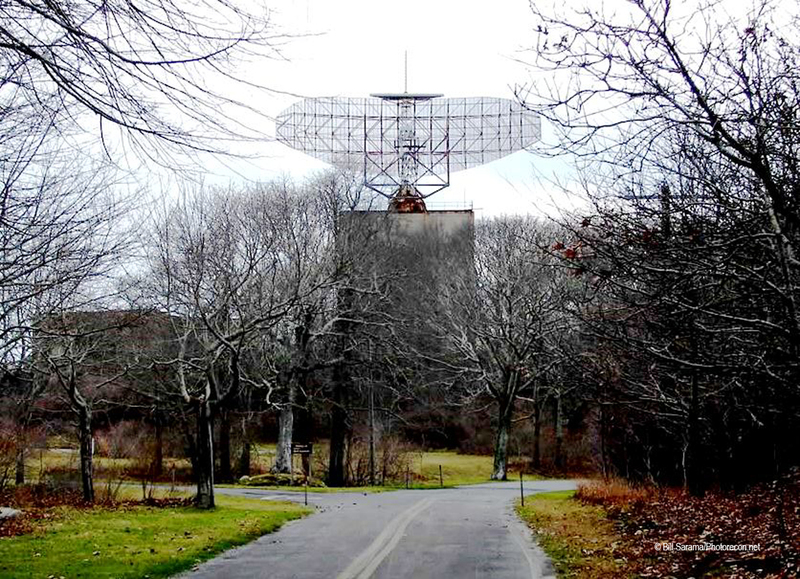 (This set up still exists at Sandy Hook NY-56 and is part of the NPS Tours in the summer.) The IFC also had a maintenance facility, a spare parts storage, and the Administration Area (AA). 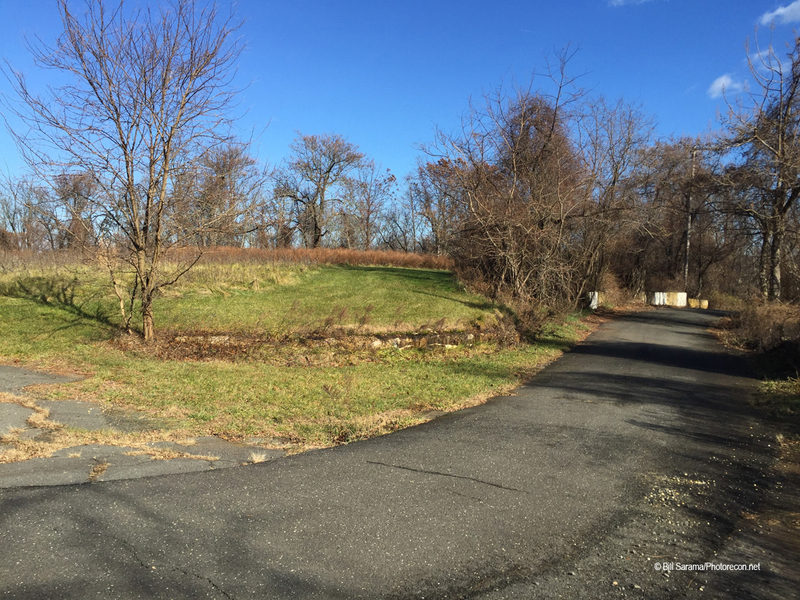 The AA had barracks, a Ready Room, A Mess Hall, recreation areas and offices. 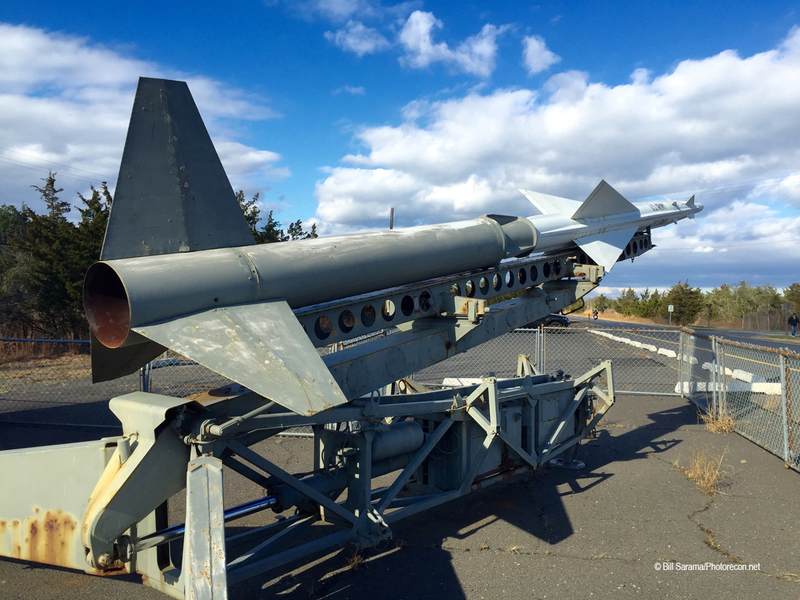 Sandy Hook received new Radars when they converted to the more advanced nuclear-tipped Nike-Hercules system in 1958. 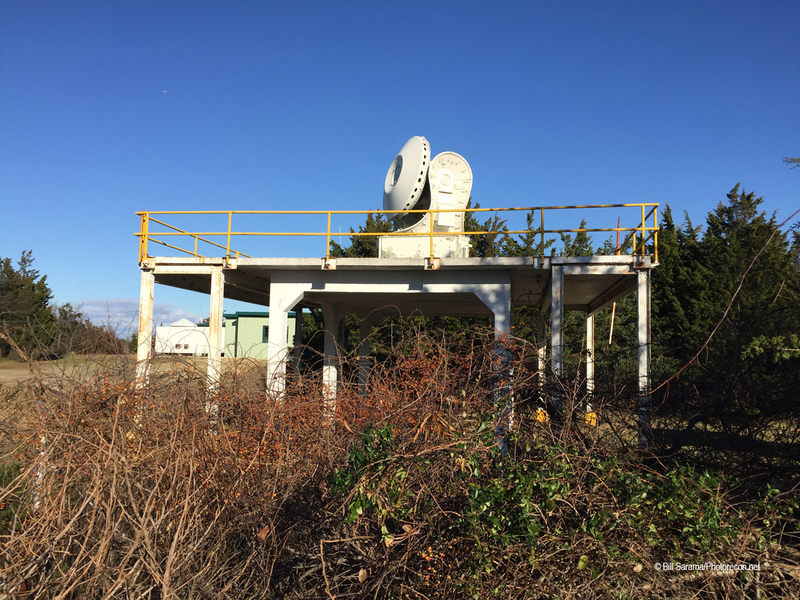 Each of the two radar clusters at Sandy Hook contained 5 radar mounts and equipment that still exist: the “High Powered Perimeter Acquisition Radar” (HIPAR) – the largest radar and longest ranged radar on a 20-foot high circular stand housed in a protective geodesic radome; the adjacent HIPAR Control Building; a Power Generator Building; the “Target Tracking Radar” (TTR) – mounted on a lower height hexagon stand with a smaller radome housing a ball-shaped radar screen; the “Target Ranging Radar” (TRR) – similar in design to the TTR radar; the “Missile Tracking Radar” (MTR) – also similar in design to the TTR radar; a large Antennae for radio communications and wireless command transmissions; and a “Low Powered Perimeter Acquisition Radar” (LOPAR) with a shorter range – also on a hexagon stand with a curved “T” shaped radar housing. The LOPAR was actually a radar from the earlier Ajax system that was retained for greater radar power when they switched to the Hercules longer ranged systems. Some IFC’s got a sixth radar per 8-missile cluster – an “Alternate Battery Perimeter Acquisition Radar” (ABAR) – either a AN/FPS-69, an AN/FPS-71 or an AN/FPS-75, all designed to track targets for an alternate missile site if required. The 3 tracking Radars noted designated target azimuth and range data from either the HIPAR / ABAR or LOPAR system. The Target Ranging Radar System recorded “Designated Target Positioning Data” and “Antennae Positioning Data” that would all be sent to the Computer System Trailer by Data Link. The sixth radar system would control the outbound Nike missile to hit the inbound bomber target. This was the “Missile Tracking Radar” system. This system would control the Missile Positioning Data with the a) “Steering and Burst Orders” and b) the “Gyro Azimuth Pre-Set Data and Launch Order”. 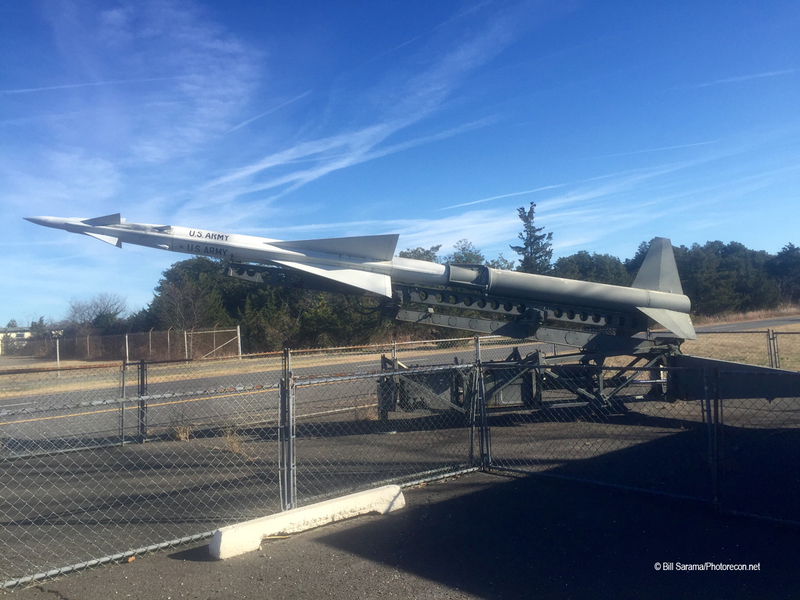 The new Nike-Hercules missile system at Sandy Hook brought changes in the “Command, Control and Communication” (C3) System of the Batteries. With Nike-Ajax, operational combat control ultimately tested on the individual battery; for the longer range Hercules, a new system was devised to coordinate the efforts of multiple batteries. Development of an automated Command and Control for Nike had commenced in the early 1950’s. Until 1957, all “Army Air Defense Command Post” (AADCP) operations were performed manually, utilizing plotting boards. The first integrated electronic air defense system that was developed to replace the old manual operations was the AN/ FSG-1 “Missile Master” that was designed by the Martin Company. 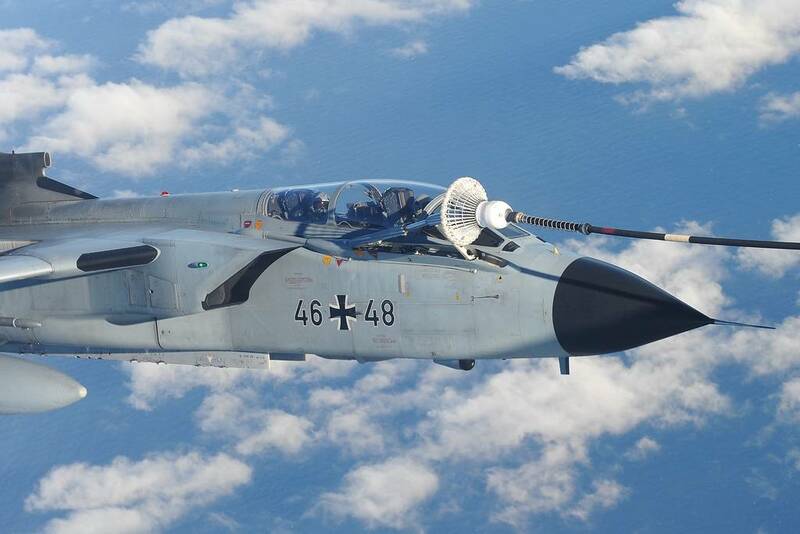 The system featured its own new radars, multiple computers, and electronic plotting devices that had enabled the coordination target acquisition, tracking and battery missile firing. Missile Master was housed in a semi-hardened blockhouse and could monitor 24 sites against 50 individual targets. 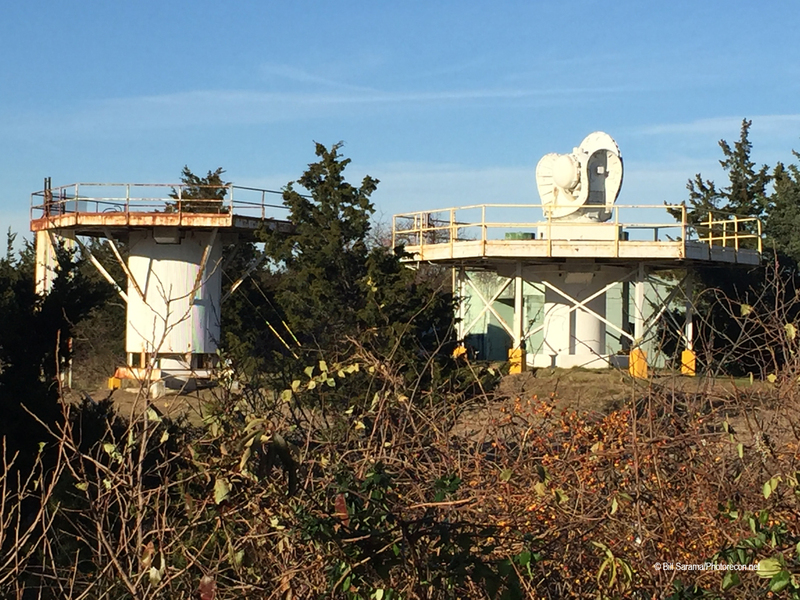 Missile Master C3 Control was located on the nearby 500 foot high hill at the “Highlands Air Force Station” overlooking Sandy Hook about five miles away from the NY-56 Nike Base. (The Highlands AFS underground concrete Control Bunker was decommissioned in 1974 and demolished and covered over in 1994.) A second simpler C3 system was the AN/GSG-5(V) “BIRDIE” system. BIRDIE was designed to handle 4 to 16 Missile batteries. 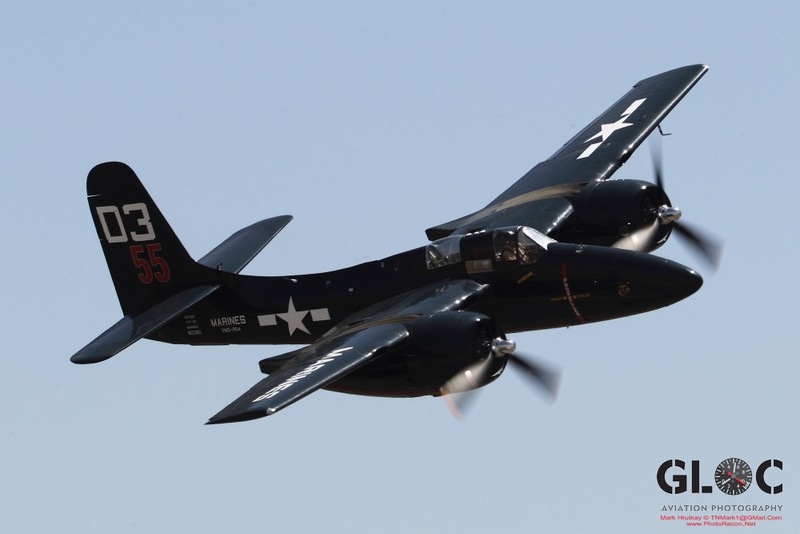 BIRDIE, which stood for “Battery Integrated and Radar Display Equipment”, was designed for smaller defensive areas. 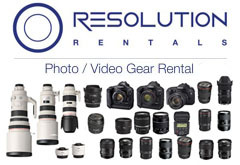 Nearby BIRDIE systems were at Otis AFB and Langley AFB. A third C3 System was the new Hughes AN/TSQ-51 “Missile Mentor” Command and Control system that came on line in the mid-60’s. Missile Mentor featured all solid state construction and could control 24 firing batteries. It replaced seven Missile Master installations by 1967. Many defense sector areas also had a “Secondary Master Fire Unit” (SMFU) and one or more “Remote Radar Integration Stations” (RRIS).The SMFU installations served as an Alternate Command Post in the event the local AADCP command post was destroyed. 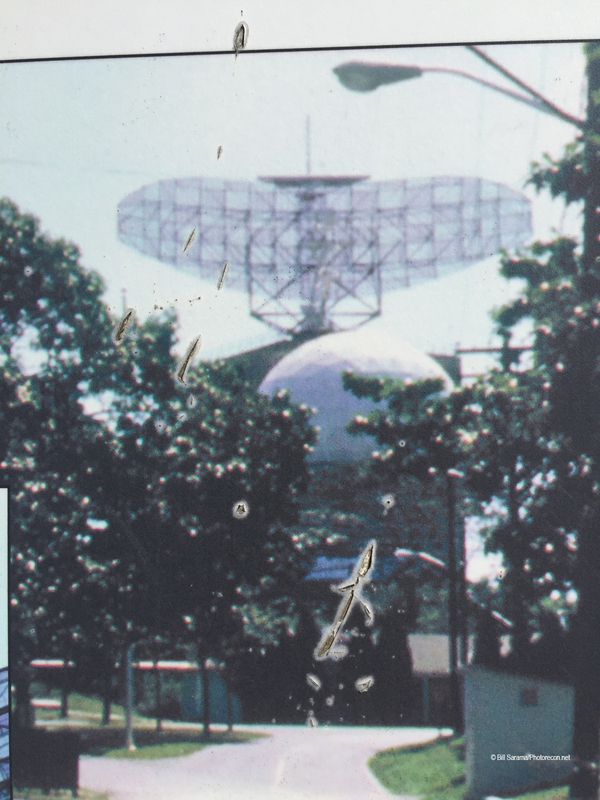 The RQRIS were used to provide radar coverage to any part of the defense area that was not covered by the AADCP’s radars. 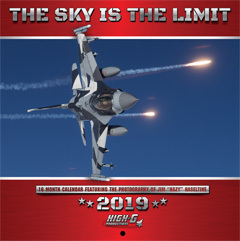 These defense area systems operated under the overall tactical command of the Air Force’s “Semi-Automated Ground Environment” (SAGE) Systems, through NORAD’s “Sectional Direction Centers” (DC’s) and “Regional Combat Centers” (CC’s). SAGE regional control for the Sandy Hook and other NYC Batteries was from Stewart AFB. Other SAGE local centers were at: Richmond ANGB VA; Dow AFB, Maine; and McGuire AFB, NJ. 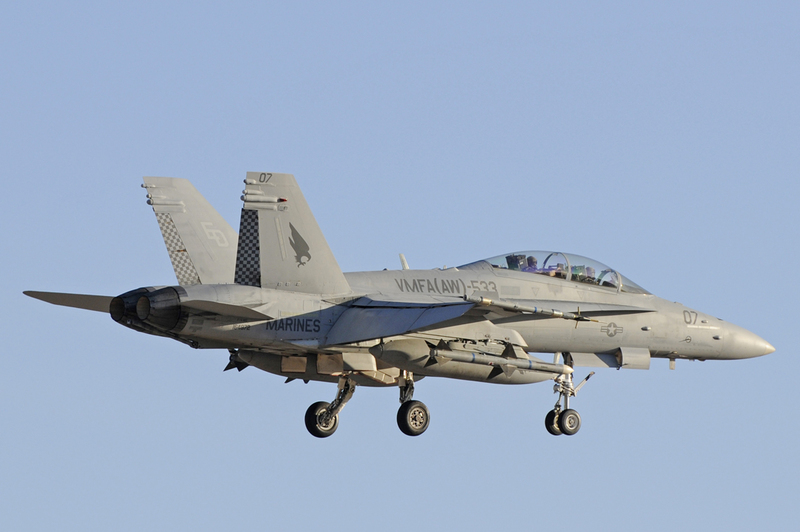 These centers received automatic detection and tracking data from a ground-based air search radar networks and height finding radars, gap filler radars, and air-borne and sea-borne early warning radars. Information from these sources was received by telephone, radio, teletype, and direct data links and programmed into a large mainframe computer. 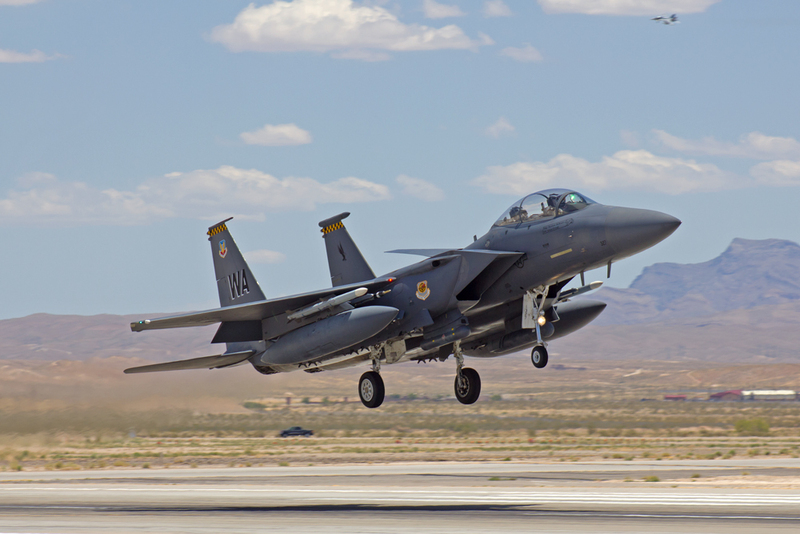 The analyzed data was then transmitted first to Air Force BOMARC long range missile systems and USAF Alert interceptor aircraft squadrons by data link. Digital data transmissions were also passed on to local Army AADCP command posts for engagement by the Nike missile batteries. Selected data was also transmitted automatically to adjacent DC’s and regional CC’s. The SAGE System was the centralized control network for all defensive assets. 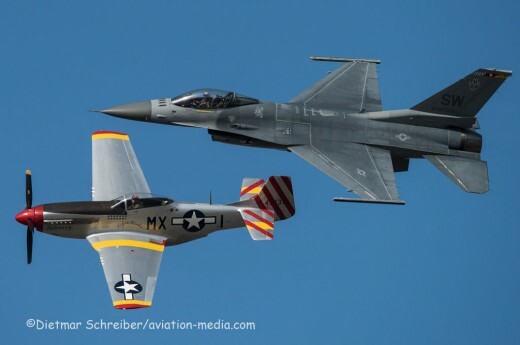 Through “Missile Master”, “BIRDIE”, “Missile Mentor” systems, each ARADCOM Battery was effectively linked by 1955 with the entire North American air defense system through NORAD’s “Combat Operations Center” at Ent AFB, CO. The above ground ADC Command Center at Ent AFB was later relocated in September 1965 to a new highly technical Command, Control and Communications Facility built deep inside Cheyenne Mountain, Colorado, which became the Nationwide NORAD Cheyenne Mountain Combat Operations Center for all of North America. 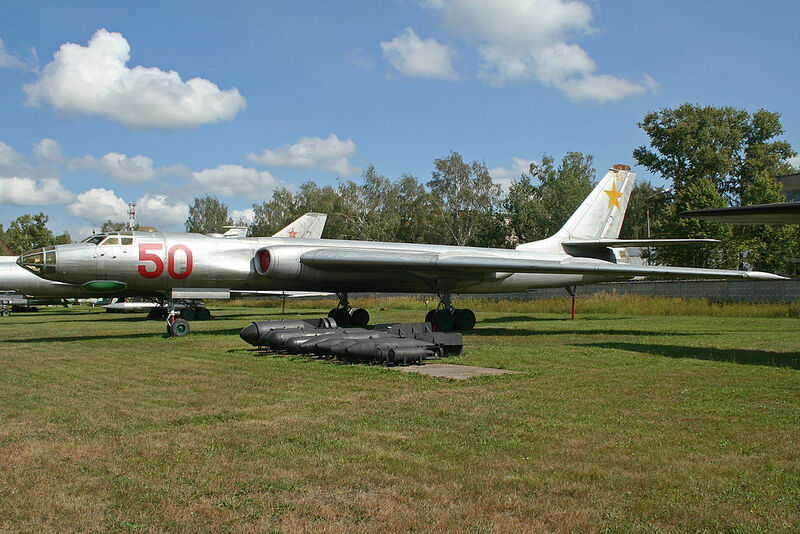 The peak year for ARADCOM (Army Air Defense Command) came in 1963 when the Command fielded 134 Nike-Hercules batteries, 77 Army National Guard Nike-Ajax batteries, and 8 new HAWK batteries in defense of the United States from threatening Soviet Tu-95 Bear nuclear bombers. 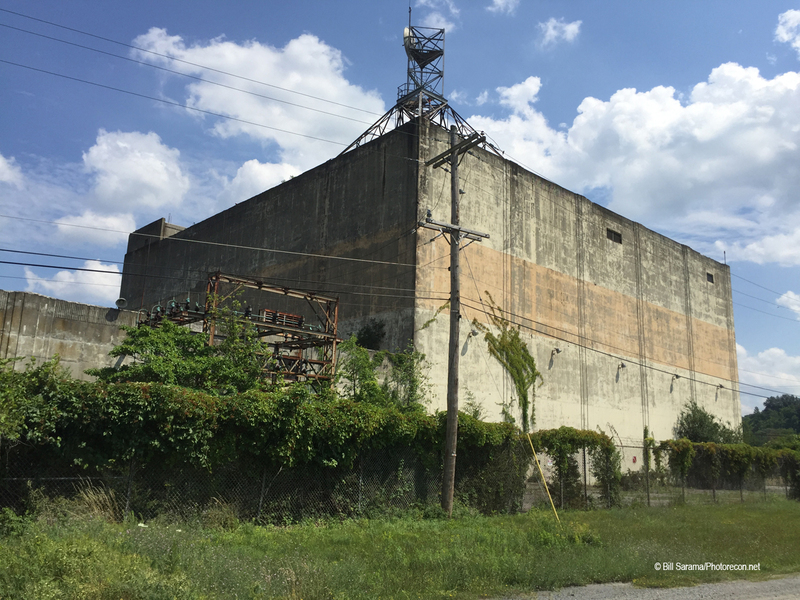 The advent of ICBM’s and the needs of the Vietnam War saw a decrease in Nike units beginning in 1967, with the first sites deactivating in 1968. 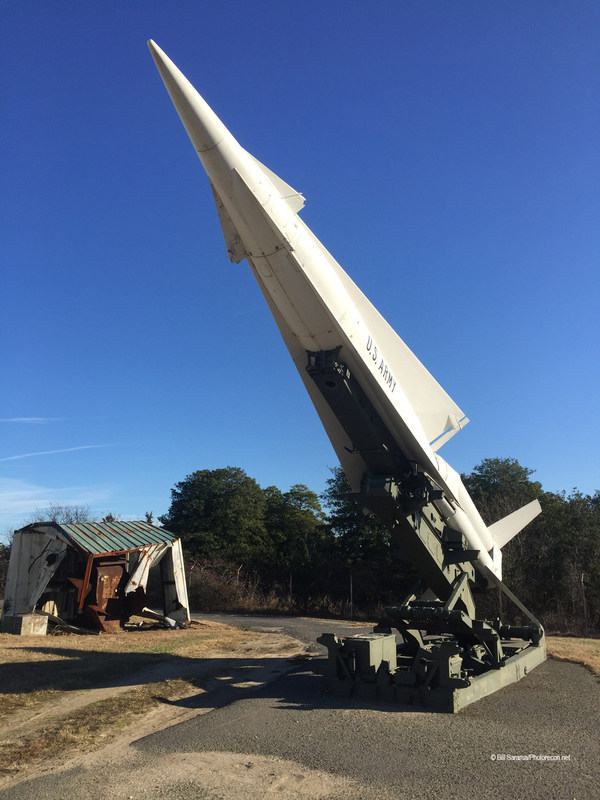 On November 8, 1973, ARADCOM was ordered by the Army to deactivate all remaining Nike missile sites. All units were to be inactivated by October 1, 1974. In the summer of 1970, a couple of Bears got a little too close for comfort. That encounter was a “Real World” example of what would have happened on an actual attack. For some reason, those Bears started turning inbound towards New Jersey. This was “Real World”, no practice, they were not going 180, and the Code Word to the Panel Operators was “Blazing Sky”, Bill Jackson said the words at the IFC that day was “Battle Stations, Battle Stations, Battle Stations — Get Those Missiles Up!” Get ready to shoot!” The real Klaxon horns were blasting!! In the 4-Missile concrete underground Missile Magazine bunker in the “Alpha Section” where Bill Jackson worked, the pre-fueled and nuclear-armed Nike-Hercules missiles were each rolled over to the missile elevator on the underground rail tracks, hydraulically lifted up on the missile elevators, then manually pushed on the above ground tracks to each of the four missile erector frames and raised to the 82 degree launch angle and made ready for firing. All the “Safe Plugs” were removed. 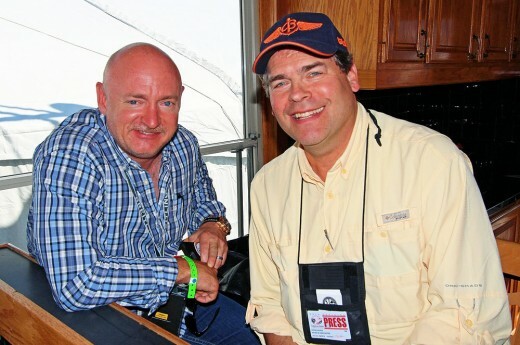 All the “Arming Plugs” were installed and activated. The Magazine hatches and air vents at the Lunch Sites were all sealed. This sequence continued simultaneously at all four missile Sections until all 16 Nike missiles were locked and loaded and ready to fire. Eight more reserve missiles were underground in the Missile Magazine ready for loading if need be. The Launch Control Crews then went into the underground protective crew shelter to await the firing sequence that was controlled remotely from the Integrated Fire Control Center (IFC). Sixteen Nike-Hercules missiles were each fully fueled and each were armed with a 40 kiloton nuclear warhead ready for immediate launch!!! Area Long Range USAF radars and the Sandy Hook LOPAR and HIPAR Radars were recording the position of the incoming flight of Bears still out in the ADIZ but visible on the radar scopes. The Computer Operators, Radar Operators, and the Switchboard Operators for the SB-22 telephone system were in communications with the AADCP Command Center at the nearby Highlands Air Force Station that had a massive radar complex and an underground Command and Control bunker, all on a high hill overlooking Sandy Hook 8 miles away. AADCP was in voice communications with the AH-AFS and target data was being plotted on the Target Plotting Board. Sandy Hook NY-56 had a manual Horizontal Plotting Board with a grease pencil. Next, the “Acquisition Radar Operator” (ARO) had two scopes going: The High Powered Perimeter Acquisition Radar (LOPAR) going out to 225 miles and the older Low Powered Perimeter Acquisition Radar (LOPAR) going out to 140 miles. The ARO shared the scopes with the “Battery Control Officer” (BCO) who was responsible for launching the missiles. The BCO actually would launch the missiles in conjunction with the Radar Operator. The BCO will also detonate the missile when it got within burst range of the Tu-95 bomber. The computer will send a “Burst Command” when the missile is close enough to the target. The BCO backs up the automatic command with a manual command to detonate the nuclear warhead. If the threat was a cluster of bombers. One such 40 kiloton nuke warhead could easily take out a cluster of Bear bombers. 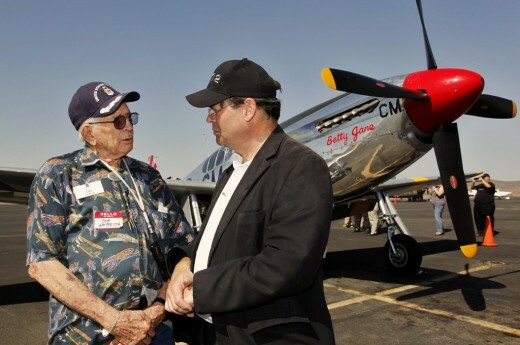 The idea was that the missile would “loft” up to 150,000 feet and arc down on the flight of bombers coming in at 45,000 feet and would detonate a 40 kt “Air Burst” on top of the bomber group taking them all out. At the IFC control area, one van contained the computer operators. A second attached van contained the radar operators. 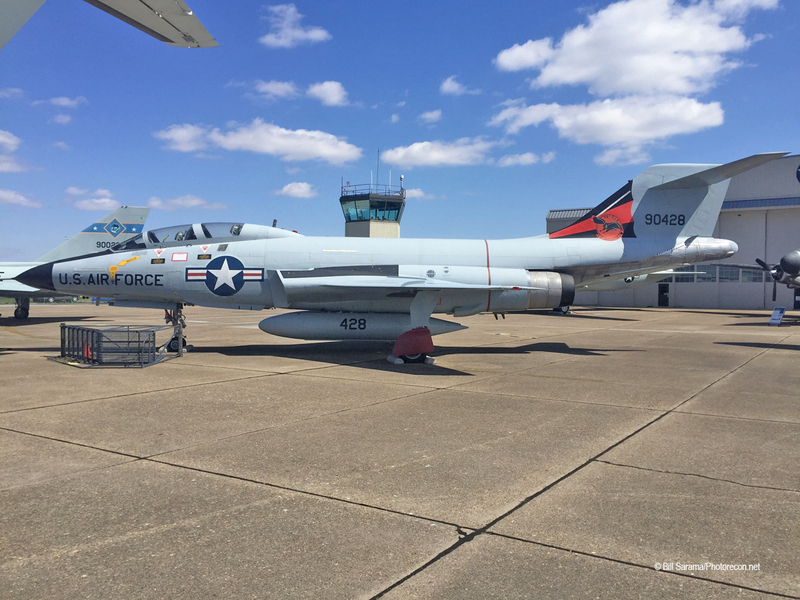 The “Target Tracking and Target Ranging” Radar Operators worked two target tracking radars both “salved” together to track the same direction of sky. 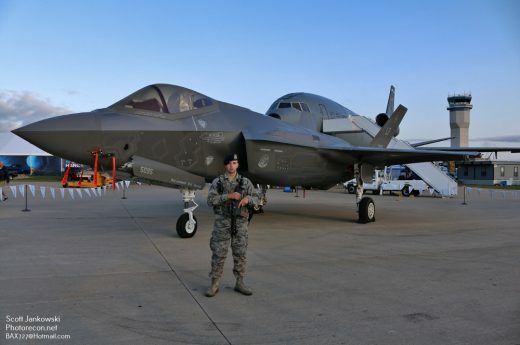 Another Radar Operator operated the Missile Tracking Radar System that, after launch, would guide the missile to the targets based on the Acquisition Radar’s target tracking data. Three men operated the Radars. 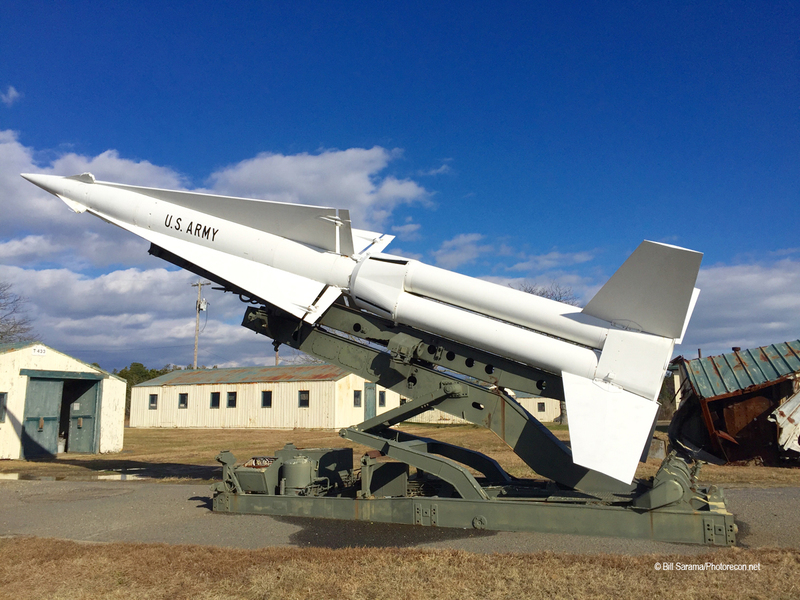 The AADCP “Army Air Defense Command Post” at Highlands AFS coordinated all targeting for Sandy Hook NY-56 Battery – either one Nike per bomber mass or one missile per a single airplane. 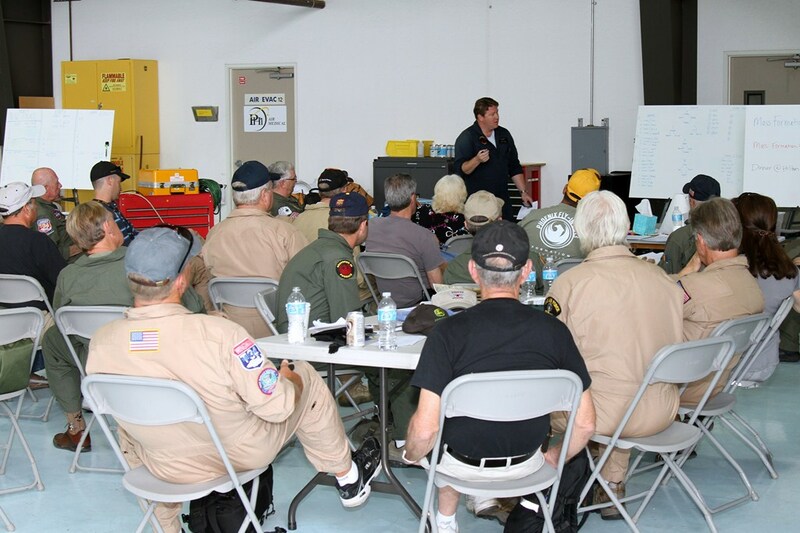 AADCP coordinated the battle plan and firing solutions for each outbound missile. Local Sandy Hook radars worked in conjunction with the longer range USAF Radars. The local BCO would fire the missile and coordinate the automatic burst command on a proximity burst or backed up by a manual burst command if required. The Sandy Hook Launch Area had two rows of 8 missiles each with one missile elevator per 4 missiles. Eight missiles were in reserve below grade. 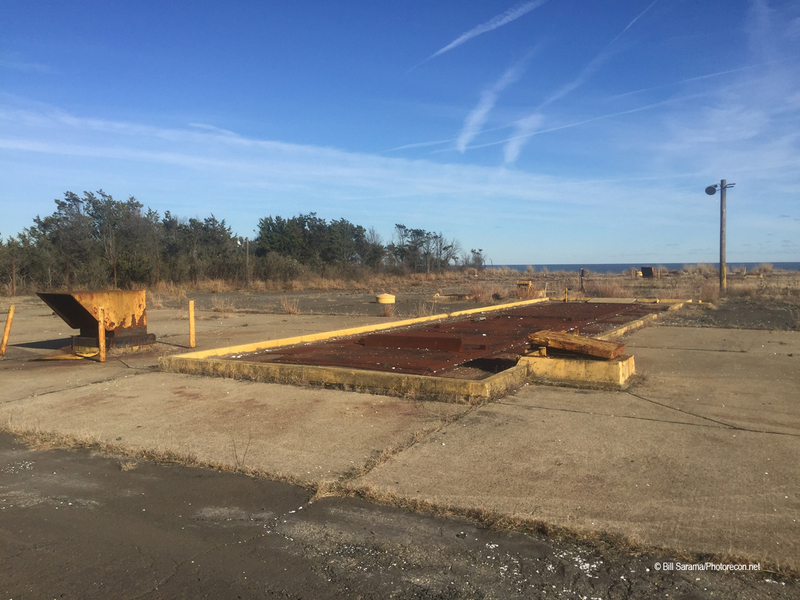 There was also a nearby Missile Assembly and Service Area that contained: a) the Nuclear Warhead Building; b) the Missile Assembly Building and c) the Generator Building. The missiles were placed on trailers and in non-alert times, brought to these buildings to be serviced. There were also nearby warhead and fuel storage bunkers. Available nuclear warheads varied between 2 kilotons and 40 kilotons in blast yield. 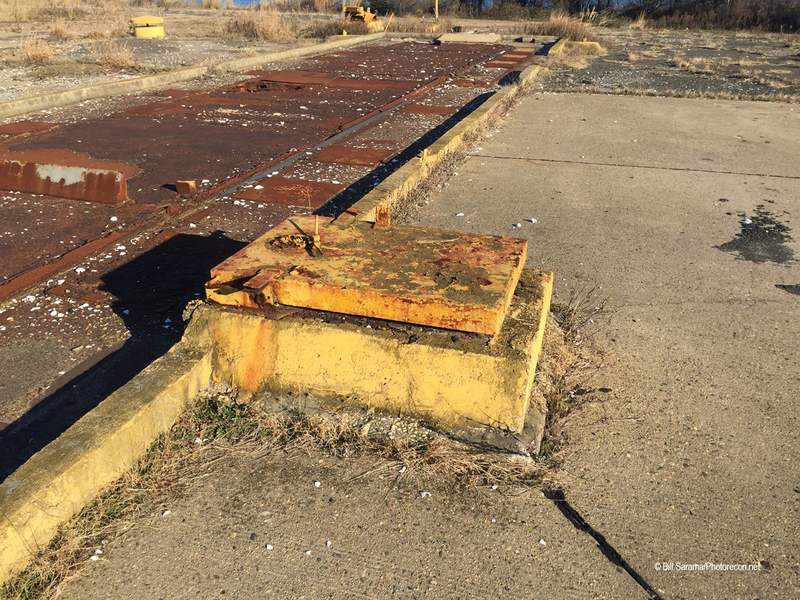 The Launch Site was in a highly guarded and double fenced area called the “Exclusion Zone”. 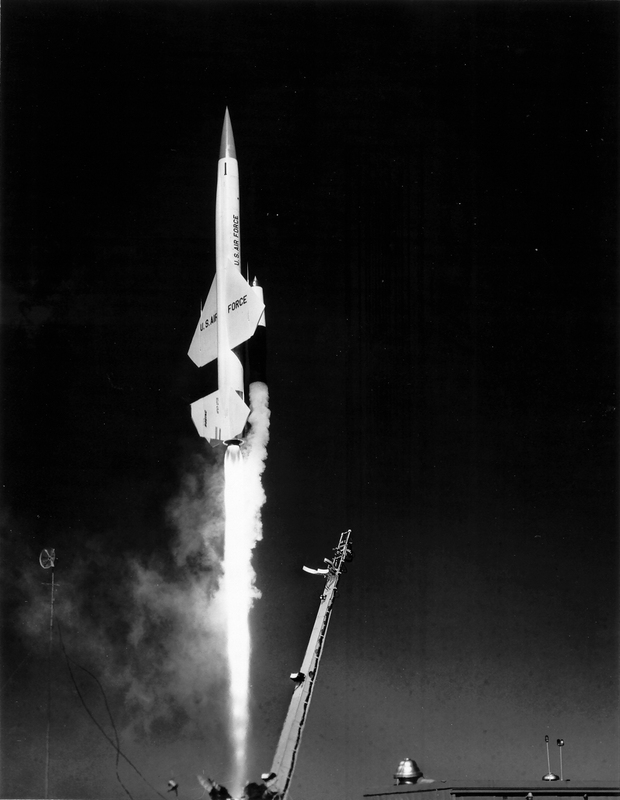 The new longer ranged Nike-Hercules missiles (SAM-A-25) (MIM-14) t Sandy Hook, if launched, would fly at 2,750 mph, had a range of 100 miles, and had a “lofted” trajectory ceiling of 150,000 feet and arc down to the individual or massed bomber formation and air-burst above the bomber flight. In this described 1970 “Real -World” Nike Alert, all 16 Nike missiles were in launch position, armed, fully fueled and target-locked and set to fire and “Held” for one hour, until the “All-Clear” was sounded and the Tu-95’s were no longer inbound. 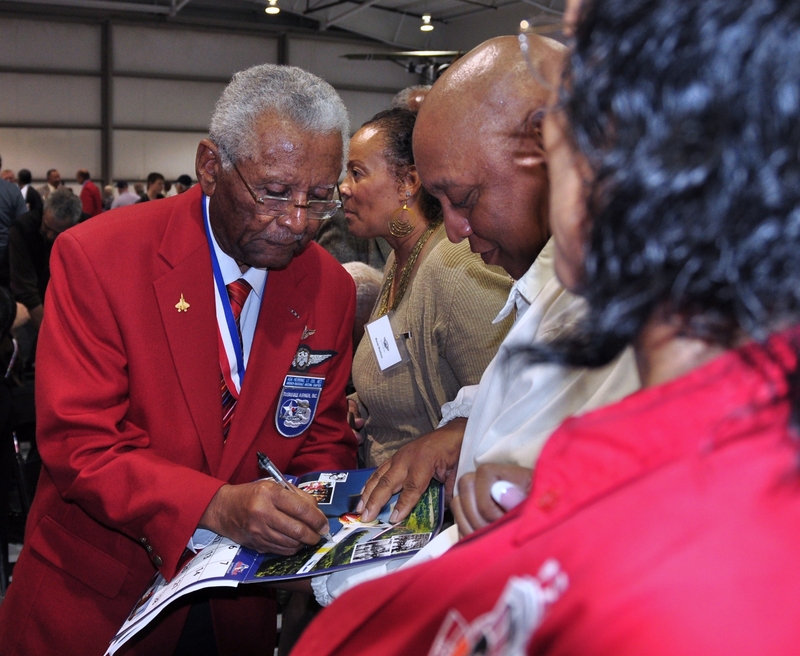 Bill Jackson remembered that the “Hold Fire” command lasted for one hour with the NY-56 Nike Battery remaining on “High Alert” all that time. The 16 Nike missiles were later manually pushed back to the missile elevators, lowered back into the concrete underground “Missile Magazine” storage bunkers, “Arming Plugs” were removed, and “Safe Plugs” were locked in, and “Missile Warmers” were activated to “keep the missiles and Nuke Warheads nice and warm” and ready for Launch Alert again. 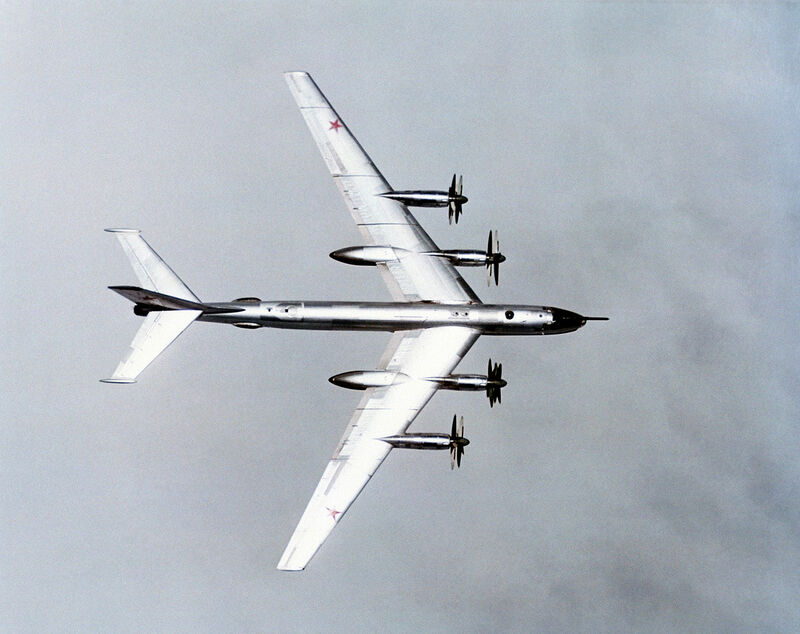 That afternoon in the summer of 1970, Bill Jackson admitted in that recent interview, that the nuclear-tipped Nike-Hercules missiles at Sandy Hook were a “Hair-Trigger” away from being launched at that Soviet Tu-95 “Bear” bomber 2-ship formation that had wandered into the USAF “ADIZ” IFF Identification Zone 250 miles off the coast of New Jersey. All it would have taken is one “Red Button” to have been pushed at the Sandy Hook NY-56 Nike Battery to have started World War-3. Thank God “THE MISSILES OF SANDY HOOK” did not have to launch on that warm summer day in 1970. We are all still here!! !